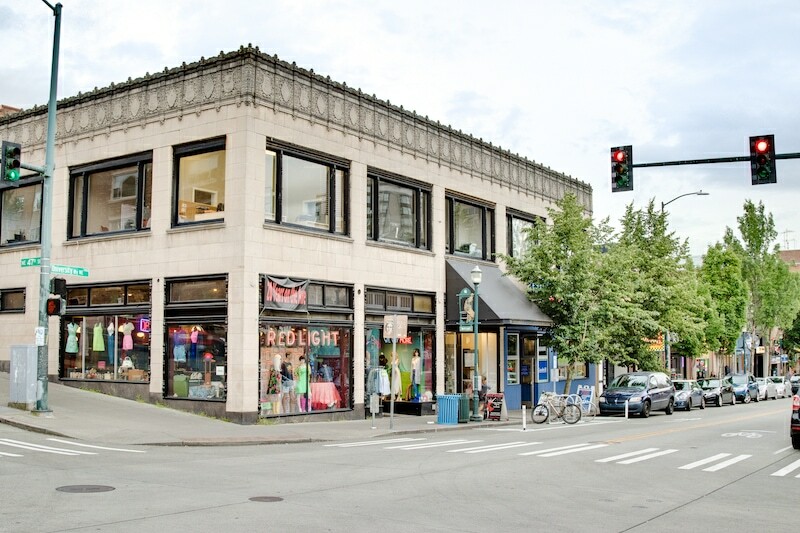 Not surprisingly, the neighborhood surrounding the University of Washington is densely packed with retail, dining, theatres and book stores, and of course many apartments, most of which are occupied by students and young professionals. There is high culture at the University Itself (The Henry Art Gallery, The Burke Museum, the UW World Series at Meany Hall) along with a lively nightlife scene, including lots of live music. The U District is one of the best places in Seattle to see independent film, too: at the historic Seven Gables Theatre, the centrally located Varsity Theatre, and the slick Sundance Cinemas. Need retail therapy? University Village is one of the city's most popular shopping destinations: an open air mall that includes hip boutiques, modern decor and of course plenty of restaurants and bistros. The University Avenue is lined with eateries, including some of the best Thai food in the city. Transit to other neighborhoods and the east side is just one bus ride away from the central bus hub, and thanks to the new University District Light Rail station, it's easier than ever to get to and from downtown (and the airport). In short, you may not find much reason to leave the U District much, but when you do have to commute, you have options. University Village: Fashion, food, decor and spa services...it's one of Seattle's favorite shopping locales for a reason. Cafe Allegro: One of Seattle's oldest, most revered cafes, it's an artsy, warm, slightly hidden retreat among the bustle. The UW Quad: The beautiful UW campus has many lovely spots, but the quad full of Yoshino Cherries is hard to beat. http://chacocanyoncafe.com: One of the city's most beloved raw and vegan restaurants...so good even the carnivores love it. The Kraken Lounge: A bar in true dive style with good pub eats, strong drinks and high energy live music nights.